In obedience to instructions from department headquarters I made an experiment with my boat torpedo on yesterday. One of the abandoned gunboats was placed at my disposal some days since, which, after loading with rubbish from the burnt district, got a draught of 6½ feet at her bow. I was anxious to obtain a draught of 7½ feet, but was unable to procure a vessel of that class. The torpedo-bearing boat for attacking this hulk was a light-built canoe about 20 feet long, with a spar suspended 6 feet from her keel and projecting beyond her bow 22 feet, at the extremity of which I placed the torpedo, with a charge of nearly 30 pounds of powder. It was my purpose to make the experiment at 1.30 o’clock p.m., that being the hour of high water, but the delays consequent upon the want of dispatch on the part of the steamer engaged to tow the hulk in place prevented the completion of all necessary preparations until 2.30 p.m. At that hour a strong northwest wind, amounting nearly to a gale, was blowing, which, with the ebb tide, rendered it impossible for me to moor the hulk in such position as to attach the lines for striking her side. Every previous preparation having been, however, made, I deemed it proper to make a trial even at the risk of failure, and gave orders to strike the vessel in the stern. After great difficulty, owing to the roughness of the sea, I secured a line to the bow of the torpedo-boat, and after reeving it through a block secured to the hulk returned it through a block in the stern of the torpedo-boat, and thence to a row-boat. I then ordered the row-boat to pull away. The torpedo-boat moved with good speed to the hulk and apparently struck, but without the expected discharge. The position of the torpedo-boat seemed to indicate that the torpedo had passed under the hulk. Leaving the boat in this position I returned to the city, and after giving the hands a recess of an hour returned to the hulk to examine into the true condition of things. I then found that the torpedo, in place of striking directly in the stern, had passed diagonally under the counter of the hulk. On withdrawing it I discovered that the torpedo had not come in contact, and that the lead plugs containing the sensitive tubes and charges of chlorate potassa were entirely uninjured. Night fast coming on I secured the torpedo-boat to the side of the hulk so as to be safe from accident, determining to make a new trial the following morning. On this morning at 8 a.m. I returned to the hulk, accompained by Captain Chisolm, of the general staff, and Mr. W. S. Henerey, machinist, and after anchoring the hulk across the stream put on the lines and struck her about amidships. The torpedo instantly exploded, with little or no displacement of water. In about twenty seconds the hulk sank. On moving up to the torpedo-boat we discovered her entirely uninjured, with a very small quantity of water in her, more than half of which was there before the explosion. From all appearances the spar is uninjured. Lee’s experiments were designed to perfect the armament of spar torpedo boats, known as “Davids,” then being built. Involved with ship construction in addition to other engineering chores, Lee was a busy man at this time of the war. The spar torpedo boat that Lee was working to arm were the “Davids.” These were low-profile, steam-powered boats. The hope was, riding low in the water, the Davids could slip up close to anchored blockaders to deploy the deadly payload. 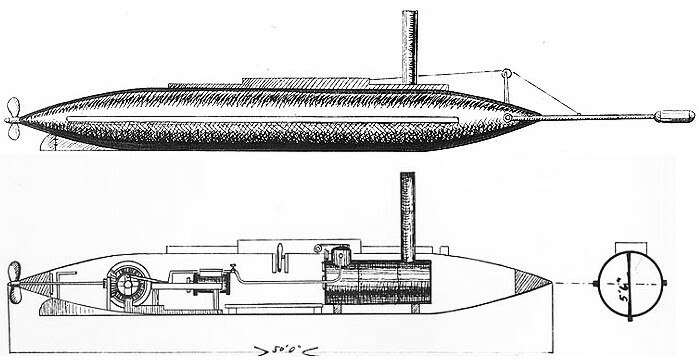 The CSS David may have looked like a submarine, but it was not submersible. And unlike the H.L. Hunley, a steam engine propelled the David. Based on the profile and mode of attack, the Davids were arguably predecessors of the light draft torpedo boats and eventually the “PT” boats of World War II fame. At least two of these type vessels were under construction in Charleston in the spring of 1863. 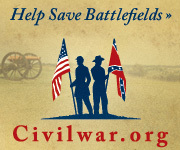 Further examples constructed in Charleston and elsewhere constituted the largest “class” of any warship built for the Confederacy. 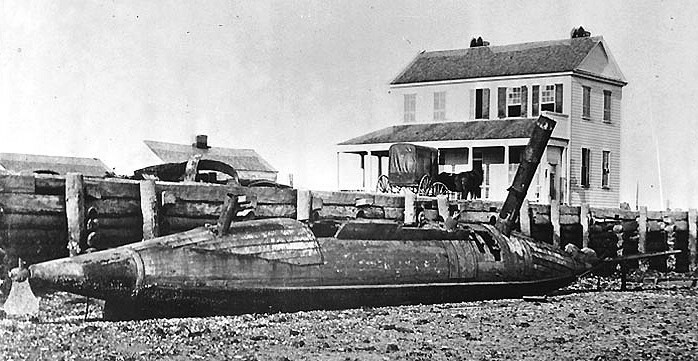 A photo taken after Charleston’s surrender in 1865 shows one of these “Davids” beached. … the device that Captain Lee was perfecting 150 years ago today. While not ready for action that spring, soon the Confederates would use these spar torpedo boats in an effort to lift the blockade of Charleston. Andy Hall has some very good renderings of the Davids on his site, including one view comparing the David to the Hunley.